Bowral Golf Club invites applications for golfing and social membership. At present the joining fee is suspended. The club has excellent golfing facilities, a traditional clubhouse, dining in the 'John Oxley Room', Members Room, bar, function facilities, events for members. The Bowral Golf Club is a tradition in the Southern Highlands and traces its history back to 1901. The club has been at its location at Kangaloon Rd since 1917. Bowral Golf Club is known for its welcome and gracious ambience. Kevin Kenny, our secretary/manager will be pleased to discuss membership options with you. You are most welcome to arrange a meeting at the club to see what Bowral Golf Club has got to offer - for golfers or social members. Our tradition is that new membership applications are displayed on the notice board then considered by the board - applicants may be called for an interview. 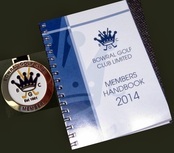 All membership applications are subject to the Club's Constitution. I would like to thank all the people who were involved in organising the Jubilee Cup this year (2018). The course was presented A class, the food and bar staff were great again. My wife (Dee) and myself enjoy coming back here each year for this event and hopefully we will be back again next year, all going well. Click 'yes' if your preference is to pay your annaul membership fees per month.